Random thought: Repeated phrases and expressions — favourites or slackery gone wild? Do you ever notice that sometimes writers or groups of writers will start using the same phrases or patterns over and over again? Like, in M*A*S*H, Hawkeye would often break into a long monologue using variations on a theme, my favourite being his response to being told to carry a gun. When you start binge-watching, these patterns become more and more clear. Sometimes it’s just the music used in certain scenes — as much as I love Chuck, for example, the love-theme music gets a little grating when it comes on, after five or six episodes. But those lines. I wonder sometimes if it’s because we catch onto certain expressions that become our favourites, or if it’s a bit of laziness. I know for myself, I have a habit of falling into “all hell broke loose” — I just enjoy the visual behind it. The implications. But when a favourite phrase gets overused . . . I have to ask why. Like Castle: he always knows just what to do. It gets annoying. So lately, I’ve been bingeing on Daredevil, ’cause it’s AWESOME, and I’ve noticed another one. Matt Murdock says it, and then I heard Vanessa say it, too. The line is “And here we are.” Or, its variant: “So here we are.” It’s just interesting — is the repetition intentional, or overlooked? If it’s meant to be one character’s thing, why does another character say it? Anyway, that’s just my random thought for the night. Happy weekend! Over the hump now . . . April 30 is growing closer, and my snowmobile story WIP is steadily approaching its (as yet, undetermined) climax. Some nights are harder to keep it going than others. So I thought I’d review for you (and me) the things I do when the going gets tough! 1) Build a word count buffer. Whenever you can, write over / beyond your minimum number for the day, so that if there’s ever a time where you’re not able to get to the project, your overall movement won’t be affected as much. 2) Take a break! Sometimes, you have to have a night off. See 1) above. The tricky part, though, is not letting that break go longer than 24 hours. At that point, it’s like going back to the gym after you’ve just started a membership and promised yourself you’d go every day and then stopped after a week. The effort of starting again feels incredibly daunting. Keep the breaks short so you don’t lose momentum on the work. 3) Accept inspiration from the strangest of places. Seriously — I get ideas from the weirdest things. Sometimes it’s from taking a walk and seeing someone outside of my regular routine. Sometimes it’s from listening to music, or talking out plot problems with a fellow writer. Just go with it! 4) Scenic Route over Efficiency. There’s nothing wrong with going off-roading with the plot. I start with a plan, but when I see a detour and a possibly better / more interesting plot point, I totally go for it, enjoying the element of mystery and surprise. Of course, that means I don’t really know what the climax will be, but I still have the end goal in mind. Buy the ticket for the long way ’round, because as the song says, it’s got the prettiest of views! 5) Fill your family and friends in. I honestly wouldn’t be able to do this without my kids’ understanding, my hubby’s back rubs (even though they’re not nearly as long as I’d like them to be), and the acceptance that my attention for this month is very much on the story. Once your near and dear ones know what you’re up to, they can also offer suggestions and act as beta-readers. 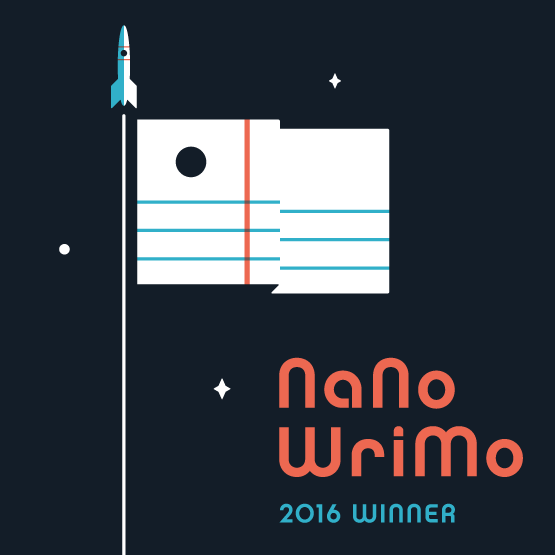 BTW, it’s a heck of a lot easier doing NaNoWriMo now that my kids are old enough to feed themselves! 6) Treat yourself. Those back rubs, and cups of tea, and bits of leftover Easter chocolate — soul food. Nourishment for the creative soul. Whatever it takes to keep your spirits up in the depths of plot problems and character disagreements, do it. 7) You can sleep when you’re dead. Sleep. Especially if you have a full-time paid job. I mean, if I was working from home, or doing the unpaid work of parenthood, it would be easier to slip in those naps than it currently is — I’m limited at the moment to catching a few z’s after school, and occasionally when I’m desperate and the coffee’s either worn off or hasn’t kicked in yet, I’ll lie on the couch that’s conveniently found a home in my classroom for twenty minutes of shut-eye. But you have to sleep. It’s right when you’re trying to fall asleep that your stupid brain will come up with the greatest plot twist or snappy dialogue. 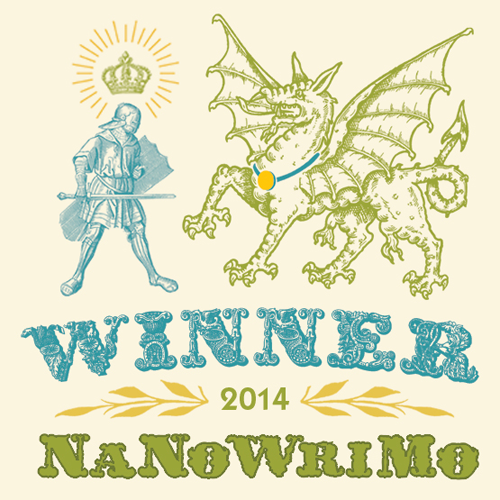 8) Write in a group of writers. For me, that means involving my students! We have had increasingly productive writing days this week, comfortably sitting together in a computer lab. It’s been my privilege to hear them to comparing their word counts, discussing their characters and plot problems, sharing mind-blowing moments and reading out bits they particularly enjoyed putting together, and to share my own writerly discoveries and problems as well. Writers helping writers. Fantastic! 9) Find your space / time relativity. For me, it has to be after the kids have gone to bed, so I’m not distracted by commentary or questions. I do frequently start shortly before bedtime, in an effort to avoid being awake until midnight (hah! ), and that’s when I get the loving kisses and hugs and tea and things. I do miss having my laptop to work from so I can be comfy on the couch, but sitting at the desk is helpful, too — I can’t look directly at the TV, for example, so I’m less tempted to have it on. Now, if only I could get the right proportion of desk height to chair . . .
10) Eyes on the prize! It can and does become daunting at times, and exhausting, to keep going on a writing project when you don’t know what is going to happen next, and especially when it’s on a topic that is out of your normal range of experience. 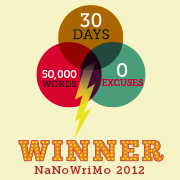 But I think that doing 50,000 words in 30 days is getting a little easier, now and then. The main thing is to remember that what is being written doesn’t need to be perfect, it just needs to be completed. A little bit at a time accomplishes so much! Feel free to add your own writing survival tactics in the comments below!